Cleaning companies offer a wide range of services that includes cleaning every parts of offices, houses, apartments, condominiums and many more. These services are perfect for busy work environments as well as families or individuals who are always on the go and does not have the luxury of time to do the cleaning. 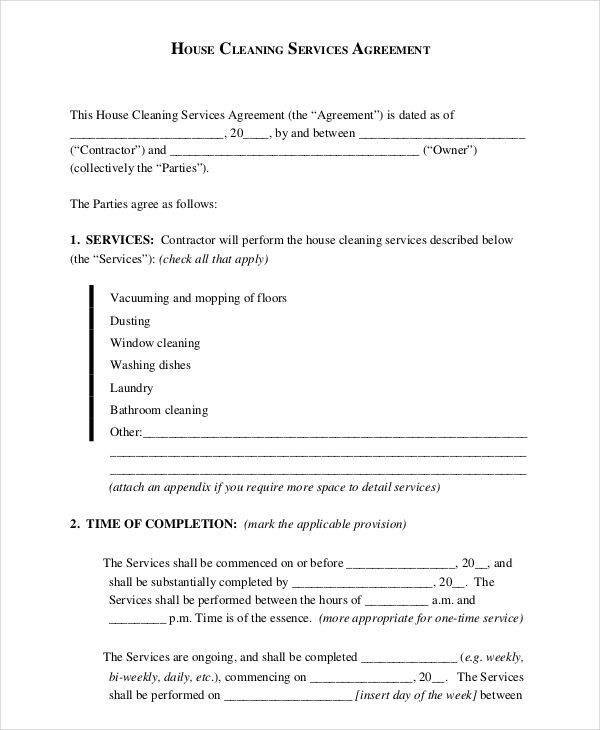 Before you can actually hire cleaning companies to do the job for you, you will need to negotiate with them until you both get to agree with the same terms and conditions and sign a contract with them. 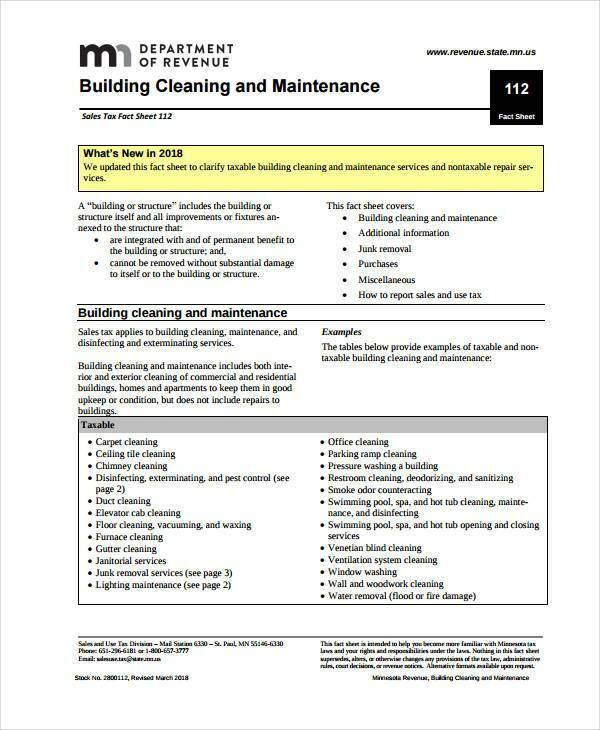 We have here cleaning company services contract templates that you can use as reference as we try to learn more about it. 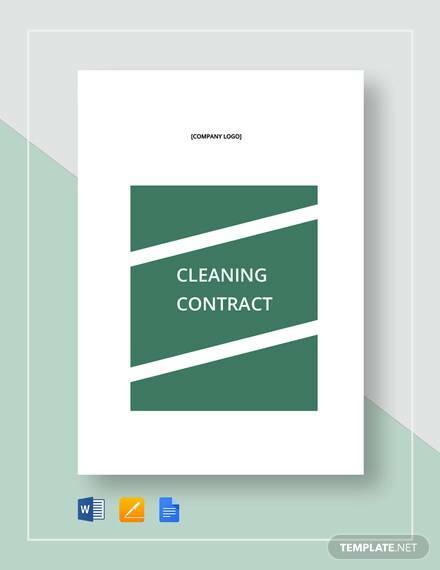 Before actually dealing with what a cleaning company services contract is, let’s first define what a contract means. A contract is an agreement that takes place when two or more parties agree to the same terms and conditions about a particular transaction. 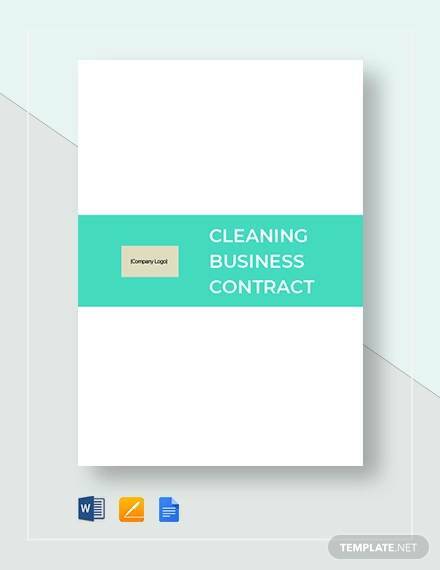 With that, we can say that a cleaning company services contract is an agreement between a cleaning company and their clients about the cleaning services that the company offers that their clients want to hire them for. The contract records specific and important details about the transaction, which then becomes the ultimate guide for each party on their responsibilities while under the contract. 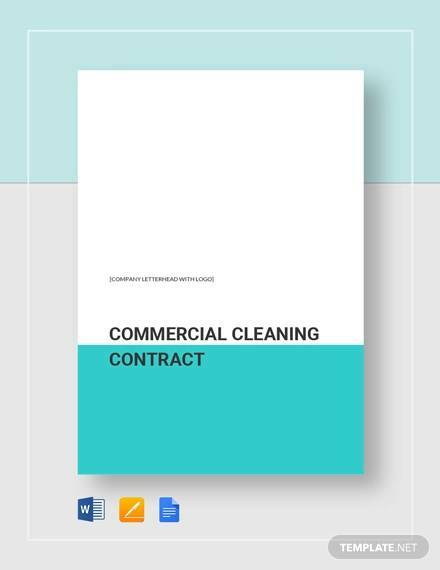 The name of the cleaning company providing the services, as well as their business address, contact details and the name of the person who is in-charge of transactions. The complete name of the client/clients, their business address, designation, job title, contact details, etc. The specific terms and conditions covered in the contract. The roles, duties and responsibilities that each party must perform under the contract. 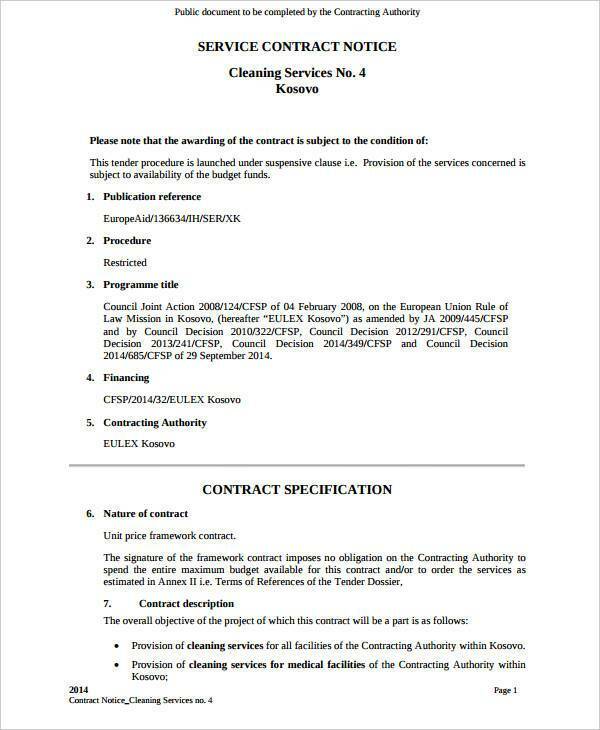 The whole duration of the contract, which includes when cleaning services should start and when it will end. 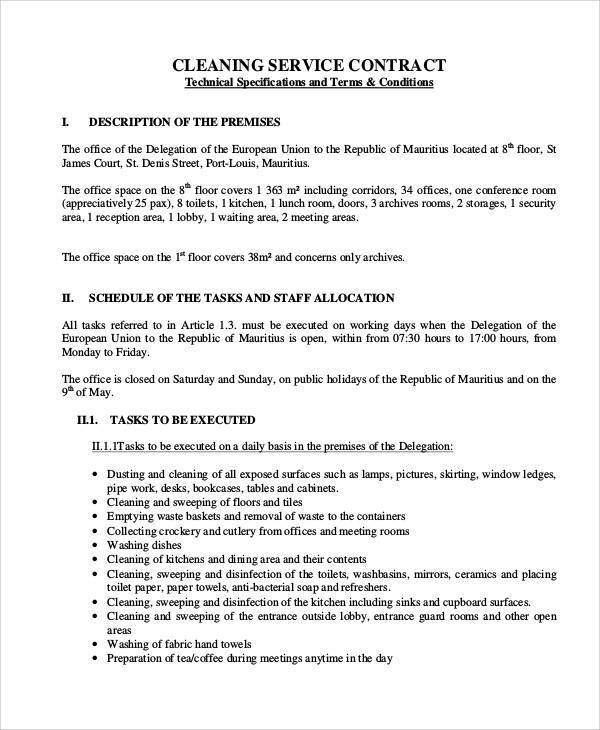 The list of services that must be rendered as requested by the client or customer. The payment terms and conditions, like frequency of payment, payment method, payment amount, taxes and other fees. Applicable contract clauses, like early termination clause. 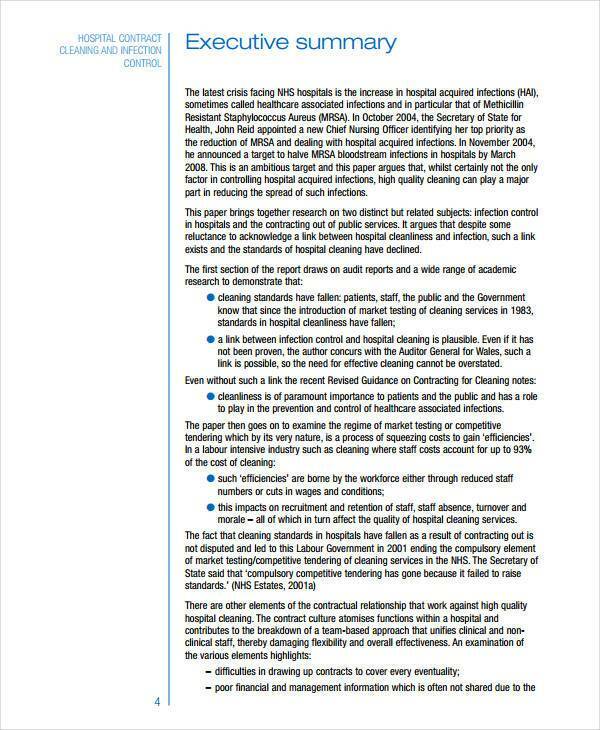 The list of contract violations or breaches together with their corresponding remedies. And the list of components or parts included in a contract goes on. 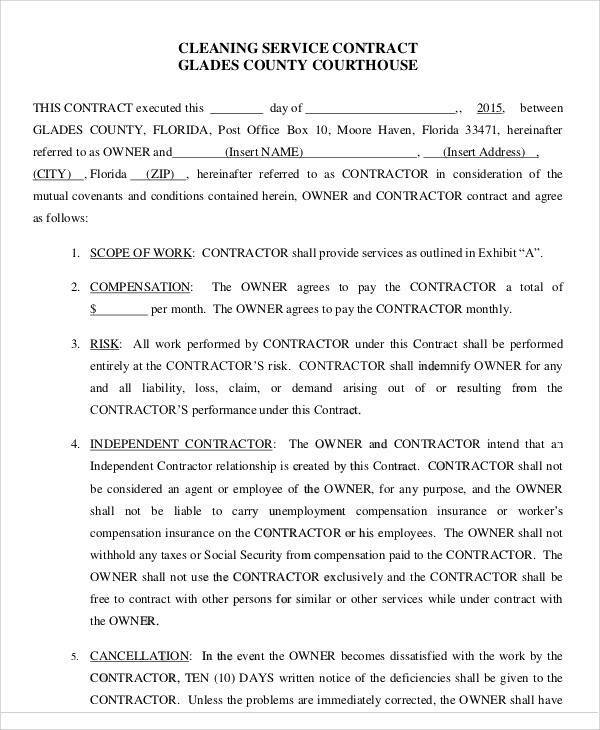 To know more about contracts and other related topics, you may want to check out articles, like Auto Sales Contract Template, Outsourcing Services Agreement Templates, and Management Contract Samples & Templates. Contracts are not just documents that provide details of a transaction. The best way to learn and understand contracts is by knowing their uses. Contracts are used to record and document everything that has been discussed and agreed on in a contract. It is used as proof that the said transaction actually took place and was not made up. When the need arises, contracts are presented in court as a form of evidence to defend the cause of either party or to prove their innocence. Contracts binds the parties involved and this is what makes them comply or oblige to what the contract says. It is used as a guide or reference for both parties on the things that they must do and must not do. It clearly states the provisions of the contract and what it aims to achieve. Contracts are very reliable as they serve as the documentation for the entire transaction from when it started until when it will end. A contract is where you can find the proof of the consent that each party has given in the form of their signatures. Don’t you think that’s a lot of uses? It’s not even the complete list of uses yet. Other articles where you can learn about contracts and their uses are Proposal Contract Template, Yearly Contract Samples & Templates, and Wedding Photography Contract Templates. Why do you think contracts are important? 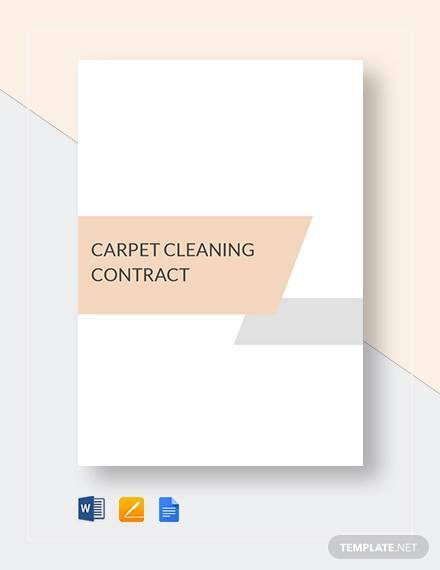 There are a number of reasons why this is so and that is why we have enumerated some of the reasons why contracts are important and why you need one. It is legally binding. When you say legally binding, it means that the parties involved in the contract must oblige to what the contract says or they will be facing serious consequences or be tried in the court of law. It helps you get paid. It is important for transactions that involves selling products or offering services to have contracts as this will help them get paid the right amount at the right time. Payment is often agreed to be done after the services has been performed. Without a contract, the party providing the services may not get paid if the receiving party just denies everything that hey have verbally agreed on. Or they could just say they will pay them at a later time. It records your entire transaction. You need to document everything that has been discussed in a transaction and the best tool to do so is with a contract. From the biggest details down to the smallest detail, everything is recorded in the contract. If not, then you will see problems real soon. It serves as guide. Contracts are the best reference if you want to review or check what you have talked about and agreed on in your transaction. Every party is provided their own signed copies so that they always have something to turn to if they have questions. It creates certainty. A contract must be certain in order to be considered valid. That is why it must be written in the most detailed and comprehensive manner. This is how parties are able to clearly understand their roles and responsibilities in the contract because everything has been clearly laid out. It gives the feeling of security and protection. When you are in a contract, especially one that is legal and valid, you can have this feeling of security that the other party you are in contract with will do their part or else they will be facing a breach. Each party can guarantee that their transaction is protected and is done according to the law. It clarifies roles and responsibilities. The roles and responsibilities of the parties who are involved are clearly stated in the contract so that they will know exactly what to do and what not to do while under the contract. Contracts are indeed important. 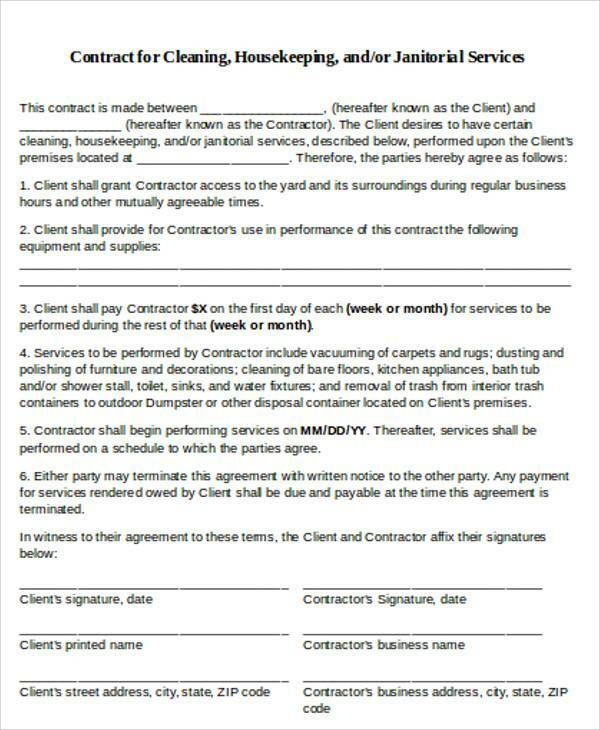 If you are not convinced with those reasons then you might want to check out templates and other contract related articles such as Puppy Sales Contract Template, Wedding Planner Contract Template, and Consignment Contract Samples & Templates. A lot of us think that the only way to become better at writing contracts is through years of experience or by simply being a professional at it. Well, even if you are none of those mentioned above you can still become better at writing contracts. Here are some tips that will help you. Use templates as guide or reference. You can use contract templates as your own and that is the quickest and easiest way for you to be able to create one. It can also serve as your guide if you intend to make your own contract from scratch. With the help of the template you will have an idea on what to put and what details are needed. Provide a definition of terms page for technical words. Not everybody is a legal professional which means that they can’t really understand contract specific words or jargon. This may cause confusion. A way to prevent that from happening is a definition of terms page. This way readers can easily look up what a certain word meant and clearly understand what the statement means. Use simple and concise words. Ambiguous words and flashy words are also known sources of confusion. You clearly don’t want that when making a contract so remember to use simple words as well as words that clearly defines what you want to convey. Make sure that you have all the details included. There could not be a sadder contract than an incomplete contract. If a contract is incomplete, its credibility and reliability becomes questionable. That is why it is also a good thing to use contract templates as guide when making a contract as it helps you make a detailed document. Be careful when making changes or revisions. The problem with making changes or revisions is that you may be making the sentences and paragraphs in the contract incoherent or irrelevant. And that is something that you don’t want to happen. It makes your contract seem unreliable. Review your work. What should you review? It is important to check for any grammar or spelling errors as this will determine if the document is professionally done or not. Of course it gives it that kind of impression. Another thing that you should review are the details or information that you have entered. They must all be correct. Follow these tips and you will surely become better with writing your own contract. For more samples templates, you can check them out on our website. 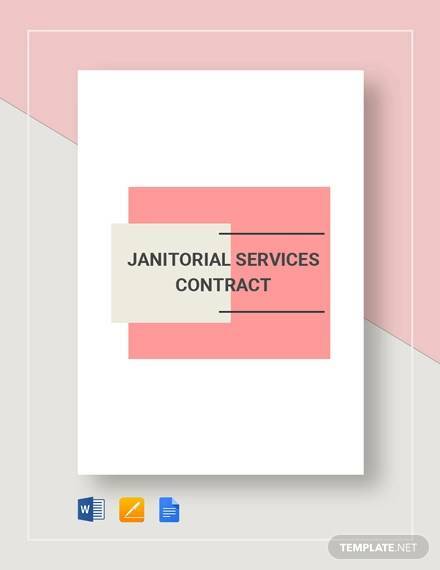 Some examples that you will surely find useful are Security Contract Samples and Templates, Free Contract Templates, Purchase Contract Templates. What can you gain from using contract templates? If you don’t know yet, here are some of the advantages that you can get just by using contract templates. Using contract templates makes your task.easy and convenient to do as there is no need for you to start from scratch or gather all the parts and contents of the contract to be able to make one. Using contract templates eliminates the need for you to create the document each and every time you need it. All you have to do is open the contract template file, enter the required information and then have copies printed. Using contract templates allows the user to save time. This is because everything that you need is already in the template and adding the required details won’t take up a lot of time. There are a lot of contract templates available online and they are mostly for free so it definitely will not break your budget. And if they are not free, you can guarantee that they are sold for a really small fee. Also, they come in different types that can be used for different specific transactions that you can choose from. 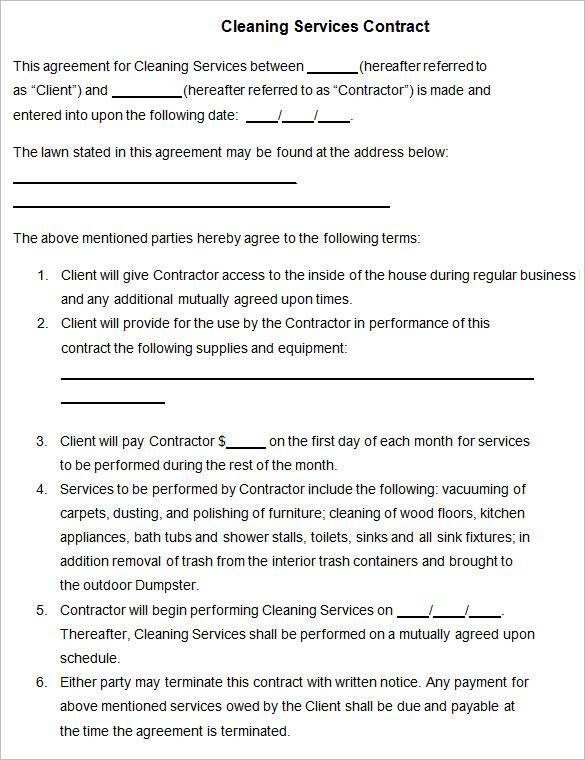 Contract templates are editable and printable. This allows the user to make the necessary changes to make the contract appropriate to their needs. There is also no need for any special tool because these templates can be printed using any printer. Because contracts contain a complete set of details, you can rest assured that your document is reliable. Using contract templates also lets the user save brainpower and energy that they can use on more important things. That’s a lot of advantages. It’s never too late to start using contract templates now. These advantages just shows how awesome contract templates are. We hope that you were able to learn something from this article. Other related article that you will surely find useful are Partnership Contract Templates, Nanny Contract Templates, and Catering Contract Templates.